What is GPS Vehicle Tracking System? 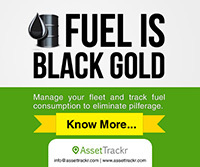 The objective of this Case Study is to introduce the technology behind Vehicle Tracking System and Fleet Management Systems which would benefit lot of people including end customers, commercial vehicle owners to keep track on their moving assets, curtail unnecessary expenses on fuel, identify vehicle misuse, increase operational efficiency and automate its day to day operations. Introduced by US initially for servicing the interest of Defense, GPS is a satellite-based navigation system made up of a network of 24 satellites (Garmin.com), transmitting on two frequencies to enable coarse and accurate position to be determined on objects which are equipped to receive and process satellite signal from a minimum of three satellites, using triangulation method. Apart from the real-time position, the receiver also outputs time, velocity and a host of other object related parameters. GPS works in any weather conditions, anywhere in the world, 24 hours a day. There are no subscription fees or setup charges to use GPS. GPRS is the main method of communication between the GPS Tracking unit and the server. GPRS, being a 2.5G mobile technology, is ubiquitously available in most of the countries. It is also ideally suitable for data transfer between a central location and mobile devices. Packet switching: GPRS involves overlaying a packet based air interface on the existing circuit switched GSM network. The GPRS information is split into packets before being transmitted and reassembled at the destination. Immediacy Provides instant connections to send or receive the message subject to availability of radio coverage. Higher speed of data transfer (currently available data transfer rates are 14.4 kbps to 26 kbps) are possible with a theoretical maximum of 171.2 kbps. Spectrum Efficiency: GPRS radio resources are used only when transmitting and / or receiving data. Concurrency: The available radio resources can be concurrently shared between several users. Efficient use of radio resources: Potentially large number of users can share the same bandwidth. Maximize usage of network resources in a dynamic and flexible way. Reduce SMS traffic data load. Interfacing the in-vehicle GPS unit with a GPRS modem facilitates real-time transmission of the positional information to a Control Station, without limitation on data size, thereby overcoming the 160 character limitation of SMS used in GSM. Also, by storing GPS data in the Flash memory of the in-vehicle unit at regular intervals (typically one data string every few seconds), bulk data can be transmitted to a Control Station at pre defined intervals. Dark areas in coverage may prevent communication. Considering the expansion of mobile communication services in India for the past few years, interfacing the in-vehicle unit with GSM/GPRS/CDMA communication networks offers an effective solution. Facilitates providing two-way voice and data communication between the in-vehicle unit and the Control Station. Sends vehicle location and other information as an SMS or GPRS message. SMS advantage: Storage and forward facility for messages as a facility offered by the Network Service Providers. Web Based GPS Tracking system allows users to securely log in and track their assets in real – time over the Internet. The system allows users to locate their vehicles anytime and anywhere. Also, it can replay a past trace of the vehicle’s route history. It can also remotely control the car such as run alarms and locking devices. A lot of shipment companies globally use GPS Tracking Systems in their transport vehicles. It is very important for the large fleets, especially when they have big number of trucks and staffs, to manage these huge numbers of vehicles and people. What does Vehicle Tracking System comprise of? The GPS based Vehicle Tracking System comprise of an in-vehicle tracking system which consists of GPS receiver unit, CDMA/GSM Modem, on-device Data Storage unit, other peripherals and a web-based application. Through this system, the users will have the facility to monitor the movement and gather entire information of any vehicle. In the Passive System configuration, the in-vehicle unit captures positional updates every few minutes, and stores the data in its Flash Memory. The data can be reviewed at a later time with manual or automatic data download facility. In the manual data download, the in-vehicle unit needs to be physically connected to a Computer, where as in the automatic download mode use of Bluetooth/Radio/GSM/ Modem device is used to transfer the data to the server or computer. Low cost and one time investment. High resolution, providing detailed information. No need to rely on network functionality. No real-time location information available. Cannot be used to locate vehicles for dispatch and customer services. Too late in many instances to capture exceptions. In the Active System configuration, the in-vehicle unit transmits the positional data strings to a centralized and /or distributed information system in real-time time using Radio/GSM/GPRS/CDMA network. In the Exception Reporting system, it sends alerts to the fleet operator when violations or vehicle related events like break downs, emergencies etc are detected. The continuous positional data can also be stored on the in-vehicle unit and downloaded onto the system computer as in the case of passive systems. Whereas in continuous GPS Vehicle Tracking System, the positional update is sent every few seconds to the centralized/ distributed information system enabling real time applications. Long term dependence on network carrier and service provider. 12 Channel GPS Receiver with a Positional accuracy of 10 meters. GPS Position updates: 1 Pulse per second. GPS Antenna gain 16 db including cable loss. 32 bit Microcontroller used for signal processing. Location Information sent through Radio, SMS and /or GPRS consisting of Lat, Long, Date, Time(UTC), Speed, Distance Travelled, Heading. Battery backup with internal charge management. 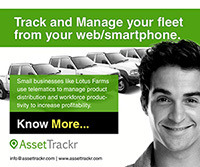 AssetTrackr was founded in 2011 with a vision to leverage Global Positioning System (GPS) and GPRS technologies to offer solutions in tracking mobile and fixed assets. Applications include online vehicle tracking, fleet management, stolen vehicle recovery, driver behavior monitoring, passenger safety, personal vehicle tracking system, safety measures for corporate pickup/drop-off service, travel time and distance consolidation on leased vehicles, hours of operation on construction equipment etc. 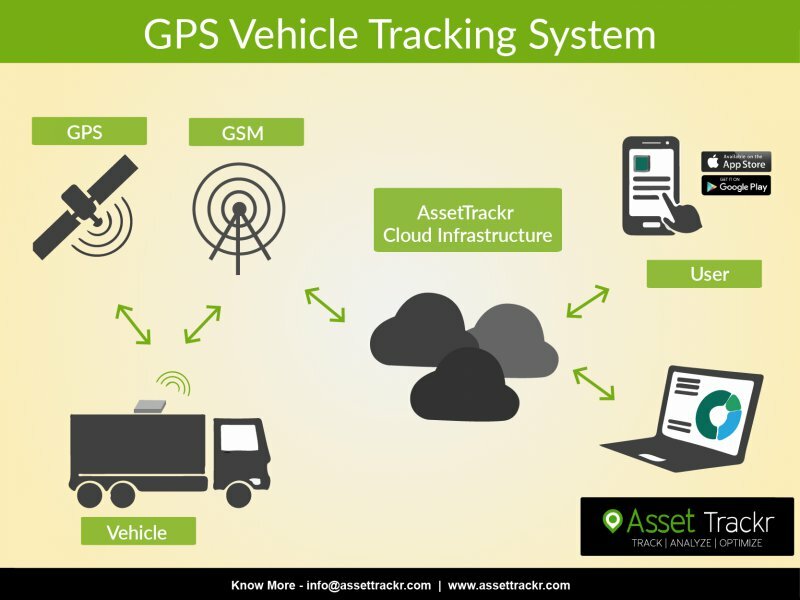 AssetTrackr GPS Vehicle Tracking solution is completely cloud-based and tightly integrated with the tracking hardware (designed to our specs) to provide a highly reliable, scalable and usable application. The solution can be completely personalized to the customer and provides role-based user hierarchy, alerts for various events like over-speeding, landmarks, Geo-fencing, and route deviation. The solution also provides consolidated reports and route mapping. A Smartphone application also provides anytime, anywhere access. AssetTrackr solution can also be integrated into ERP systems via REST API’s. AssetTrackr also provides SafeKar, a personal car tracking solution for individuals and chauffeur driven vehicles.